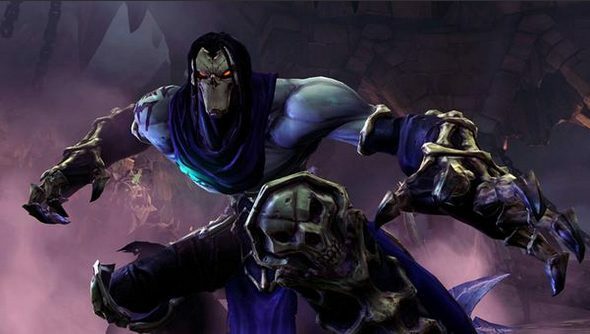 By THQ’s reckoning you’ll be just about wrapping up Darksiders 2 by now; tying off its endgame with an intestinal bow torn from the abdomen of your enemies. As such, you’ll be ready to take on clean-up duties on a couple of new caves in the first chunk of the game’s scheduled DLC, Argul’s Tomb, to be released on PC next week. Tuesday’s DLC is “tailored towards players that have finished at least the first three zones of the main game” – presumably an indicator of formidable difficulty – and will set you back $6.99, in return for two new dungeons, new loot, new enemies and new bosses. If you’ve bought the Limited Edition, you’ll already have a code which will allow you to redeem Argul’s Tomb for free. Darksider types: are you ready for more dungeons? Or have you had your fill of gizzards?